The influence of rock ‘n’ roll legend Little Richard (a/k/a Richard Penniman) has spanned seven decades now and shows absolutely no sign of dwindling in the new millennium. Little Richard’s groundbreaking blend of R&B-tinged, rockin’ piano-pounding earned the singer Top 20 hits with a string of red-hot 45s, songs that would inspire a generation of rock, soul, and funk artists to follow. Little Richard would be inducted into the very first Rock & Roll Hall of Fame class in 1986 and was also inducted into the Songwriters Hall of fame and earned Lifetime Achievement Awards from both The Rhythm and Blues Foundation and The Recording Academy. For the singer, it all began with the hit singles that would end up making up the bulk of his debut album, Here’s Little Richard. Released in March 1957, the album built upon Little Richard’s previous chart success, the singer scoring six Top 40 hits over the previous year, five of which were included on Here’s Little Richard, driving the album to #13 on the pop charts. 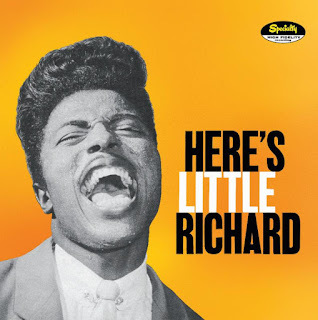 In celebration of the 60th anniversary of Little Richard’s auspicious debut, Craft Recordings – the catalog division of Concord Music – is reissuing the landmark album as a two-CD set on November 3rd, 2017. This deluxe reissue of Here’s Little Richard includes the original twelve-track album, anchored by timeless rockers like “Tutti Frutti,” “Ready Teddy,” “Long Tall Sally,” “Rip It Up,” and “Jenny Jenny.” The second disc features twenty-two demos, alternate takes, and previously-unreleased material from the original studio sessions.